Hey, Gantos boy! Well done! I loved this book. I think it is wonderful that it is a coming of age tale about an eccentric young boy and some interesting characters from his small town but knowing that the small town is just down the road from me made it all much more intriguing. This book is peppered with a lot of comedy throughout and has a nice little mystery in it as well. I really enjoyed reminiscing about the days when I was a kid and we actually went outside to play with other neighborhood kids. I think that kids today don't spend enough time doing this and they are missing out on creating some really great memories. I enjoyed the details about history that were intertwined among the story line as well. I loved it when Miss Volker counsels Jack, "Don't ever forget your history," she sang, "or any wicked soul can lie to you and get away with it." I think that this is a book that many of my students will enjoy reading and they may learn some facts and even more importantly, they may gain some wisdom by reading this. 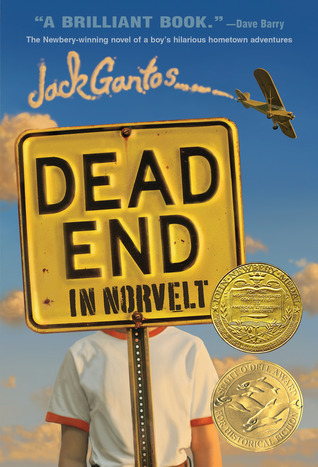 Sign into Goodreads to see if any of your friends have read Dead End in Norvelt.